EghtesadOnline: Changes in Iran Mercantile Exchange regulations have done wonders for the stocks market. Talks of the removal of price ceiling for steel products in IME led to a major inflow of capital into the stock market in the starting days of the week. On Wednesday, by officially authenticating the news, TSE rallied with its all-share index TEDPIX gaining an unprecedented 6,483 points to surpass 155,000 points upon the closing of the market for the week. TEDPIX went up 17,346.9 points or 12.6% during the week that ended on Sept. 12 to close at 155,061.06. Iran Fara Bourse’s benchmark index, IFX, gained 193.4 points or 12.2% to stand at 1,771.3, according to Financial Tribune. The fluctuation cap for the price of steel products on IME, which had been set at 15%, was removed last week. Additionally, a member of the Securities and Exchange High Council announced that petrochemical products would follow the same lead, which added to the excitement of investors who then rushed to pour their money in the two major industries. Minister of Industries, Mining, and Trade Mohammad Shariatmadari confirmed the council's announcement in a press conference in the northern province of Gilan on Thursday, ILNA reported. 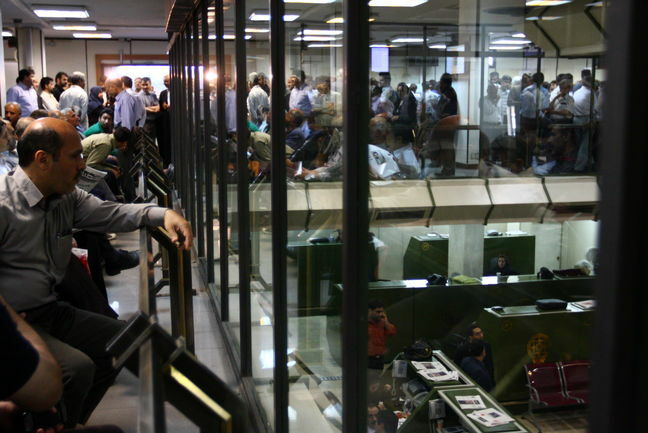 As Iran’s stock markets close on Wednesday, the high official’s words have yet to show their impact on the indices, which makes one believe that the stocks’ gains will not be muffled in the coming week. Another factor strengthening hopes of a further rise in stock market indices is the astonishing value of the rial against the greenback. One element supporting this belief is the fact that nearly all industries offered at TSE were colored in green last week. This phenomenon is due to the inflow of fresh capital into the market, meaning more natural entities, regular Joes, are investing their rials into the stock market so as to cushion the blow that the devaluation of the currency will deliver to their possessions. Historically, the same incident was witnessed in 2012 when the rial nosedived against the dollar. Analysts believe that the inflow of capital will continue as long as the price of shares has not caught up with the inflation, which means new investors will continue to abound, Donya-e-Bourse reported. The reasons mentioned above, together with the reignited hope that policymakers have finally caved in to the wishes of the private sector to do away with subsidies, have given rise to the speculation that the Iranian stock market indices still have a long way to go before they settle down. That said, it is also important for investors, both active and potential ones, not to get caught up in the moment, as no one is sure how long the rally will last. And in the end, whether this will transform into an all-out bull market is also highly doubtful. Over 16.67 billion shares valued at $340.41 million were traded on TSE last week. The volume of traded shares increased by 24%, while trade value went up by 44% compared to the week before. TSE’s First Market Index gained 14,603.7 points or 14% to end at 115,921. The Second Market Index increased by 25,785 points or 9% to close at 300,723.3. The price index went up 5,048.4 points or 12.5% to settle at 45,319.9, while the industry index went up 15,928.1 points or 12.6% to end the week at 141,775.9. TSE Free Float Index gained 19,348.88 points or 13.1% to settle at 16,246.58. TSE top 30 and top 50 gained 941.1 (14%) and 21 (12.7%) respectively, closing at 7,637.5 and 6,711.1. At IFB, over 5.18 billion securities valued at $234.04 million were traded, increasing by 29% and 54%, respectively, compared to the week before last. IFB’s market cap gained $1.64 billion or 12% to reach $15.67 billion. Its First Market witnessed the trading of 571 million securities valued at $11.18 million, registering a 64% increase in trade volume and a 75% rise in trade value. About 1.76 million securities valued at $53.90 million were traded in the Second Market, showing an 18% and 52% increase in trade volume and trade value respectively. Over 17 million debt securities valued at $109.42 million were also traded at IFB, showing an increase of 44% in volume and 46% in value. Exchange-traded funds traded 80 million shares worth $10.98 million, registering an increase of 47% in volume and a 115% rise in value. Housing Mortgage rights registered a 9% rise in both volume and value, as their trade reached 430,000 shares worth $2.13 million.